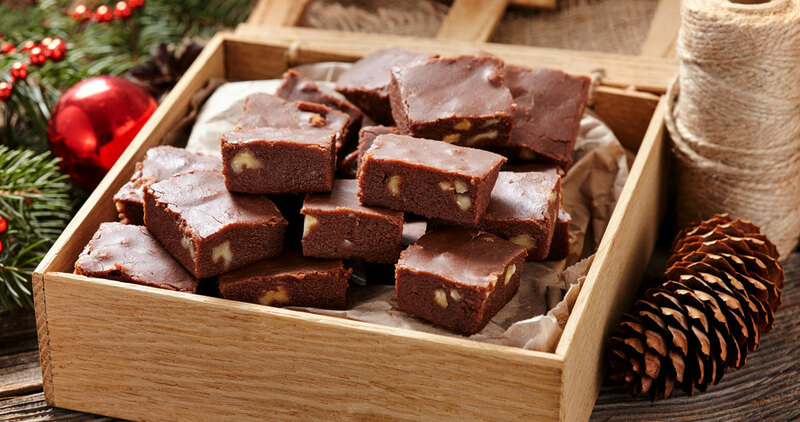 Rich and decadent, this fudge recipe brings some serious holiday cheer to your kitchen. Heavily butter a 9 x 13-inch baking pan and set aside. Place the sugar, salt, butter, and evaporated milk in a large, heavy saucepan. Bring to a boil over medium-high heat, stirring constantly. When the mixture comes to a boil, reduce heat to medium. Boil gently for 8 to 9 minutes, stirring frequently to make sure the bottom does not scorch. Stir in the chocolate chips, chocolate bar, and marshmallow creme until the mixture is well-blended. Stir in the vanilla extract and nuts. Pour the mixture into the prepared pan. Cool at room temperature for several hours, or until set. Cut into 1-inch squares. Store in an airtight container for up to 2 weeks, if they aren’t consumed long before that.